39. The eastern end of the New Lamp Zone and beyond. 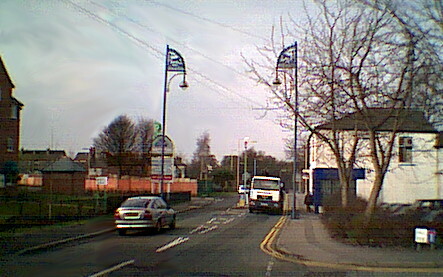 A shot of the eastern pair of fancy lamp posts from in front of the BP petrol station (left) and a shot of one of the old sodium street lamp just beyond the New Lamp Zone (right). The lamp post crew have been busy again. They have been sticking golden numbers on the black-painted new lamps. The ones shown in picture 40 (above, left) are now numbered 80 (north side of the road) and 81 (Stock Dove side of the road). 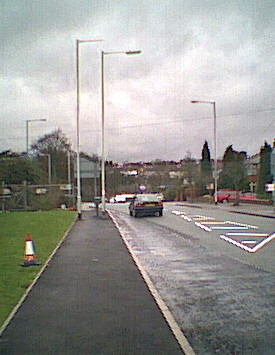 The Compstall Road sequence runs to lamp 94 at the station car park, see picture 49 (left). A new sequence begins at the railway bridge, on Stockport Road. Two non-fancy lamps under the bridge are numbered 1 (south side) and 2 (north side). 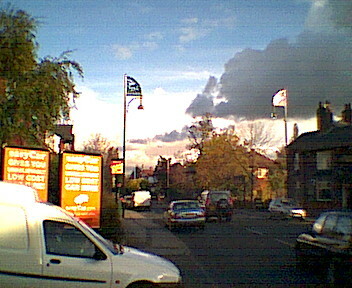 The first new lamp to have a number (3) is the one at the Romiley Arms (see both pictures 38, section 7). 40. Eighty-six the numbers, someone has blundered! The lamp post crew has been out yet again. They've got the numbers wrong in the Compstall Road section of the New Lamp Zone. The lamp at Thresher's, on the north side of the road, has been renumbered 16 instead of 80 and they've made a start to renumbering the lamps backwards towards the station on the south side of the road. But this is such a cowboy job that they stopped at No. 11. But what no one seems to have realized is that there are only 15 new lamps on Compstall Road, not 16, so the present No. 94 will become No. 2. Unless they're planning to shove another one in to spare the Triv Dems' blushes. The lamp post squad has stuck on more replacement gold numbers. The new lamp at the station is now No. 2 but they got as far only as No. 9 - the former No. 87 at the east end of the Precinct. The next one, at the Sandy Lane mini-park, is still No. 86 rather than No. 10. And the next one along on the north side of the road is still No. 84 rather than No. 12. Cowboys in action? You bet! The white van with the hydraulic arm is out again. 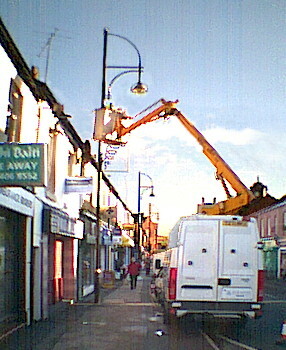 Xmas decorations are being strapped to the new lamps to supplement the excellent lights in the large trees on Compstall Road near the Xmas tree site. The pictures show (left) the van crew doing things to Lamp 7 on Stockport Road (opposite the Post Office) and (right) one they finished earlier - Lamp 5 on Compstall Road (at the Royal Bank of Scotland). 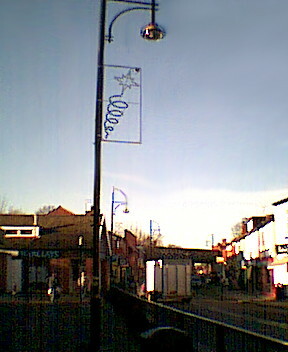 Not just the lamps in the centre of the village have been replaced. 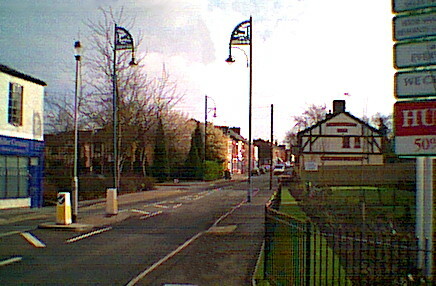 The pictures above show that there has been a further campaign to swap the plain lamp with long tops (at roadside of left pavement) for lamps with squatter, rounder tops (at back of left pavement). As these two pictures taken 3 months apart show, there is a sense of urgency about getting the work done comparable with that of the fancy lamp project. The third picture (left) takes a closer look at a round-top lamp. 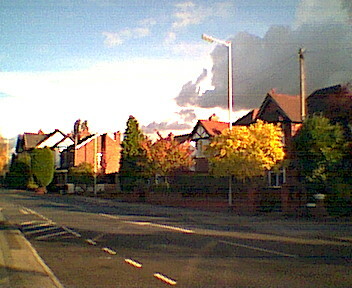 This one is the next one along the north side of Stockport Road (heading toward Stockport) after fancy lamp No. 14. The road markings belong to the new island (see 45 in Section 9). 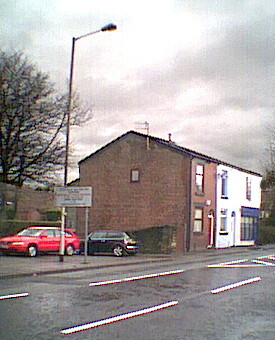 Over a year after the job began, Lamp 15 on Stockport Road (right side of the road in the picture above) is now in place facing No. 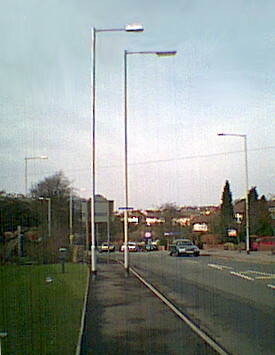 14 to mark the western limit of the New Lamp Zone. The picture above also shows the traffic island, which was added last year to help the people living at Metcalfe Court cross the road. Quite why they would want to cross here when there's nothing much on the north side of Stockport Road at this point is one of life's little mysteries. Meanwhile, lamps 11, 14 and 15 are still waiting for their coats of dark grey undercoat then their black paint with gold trim finish. Not to mention some golden numbers.